The Trustees are grateful to Lisa MacInnes of Save a Life Scotland for delivering training on the use of the new 24 hour access defibrillator located at the Pavilion at Memorial Park. Lisa put 9 people through the 1 hour training session showing best practice on CPR and also how to use the Defibrillator. 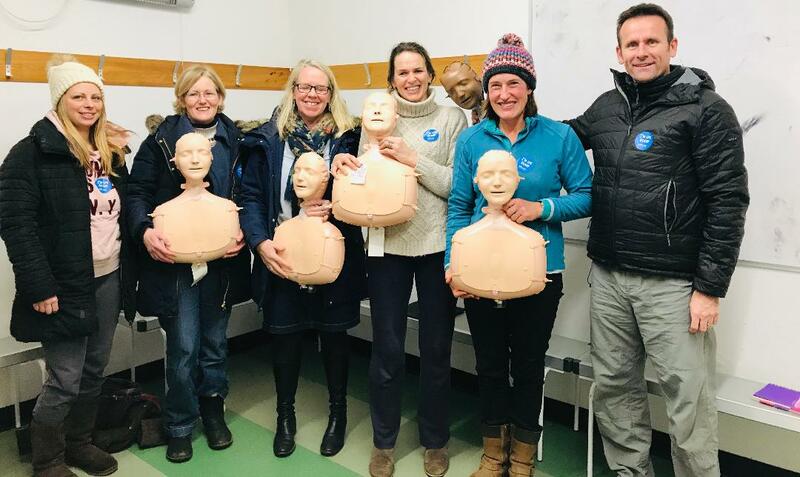 Lisa is running a further training session for the teachers at Gullane Primary School with a further couple of sessions planned for Monday 21st January & 28th January at 8pm at the pavilion for those interested to acquire a life saving skill. 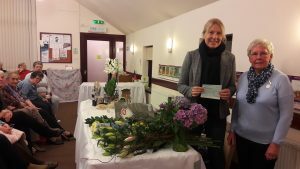 On Thursday 2nd November our Trustee Nic Wilson received a cheque of £2,000 from Maureen Hunter of Gullane Flower Club. The funds were raised during the clubs 25th Anniversary celebrations last month. This is an extraordinary amount of funds and the Trustees are very grateful for the kind donation which is earmarked for a 24hr access defibrillator at the new pavilion. 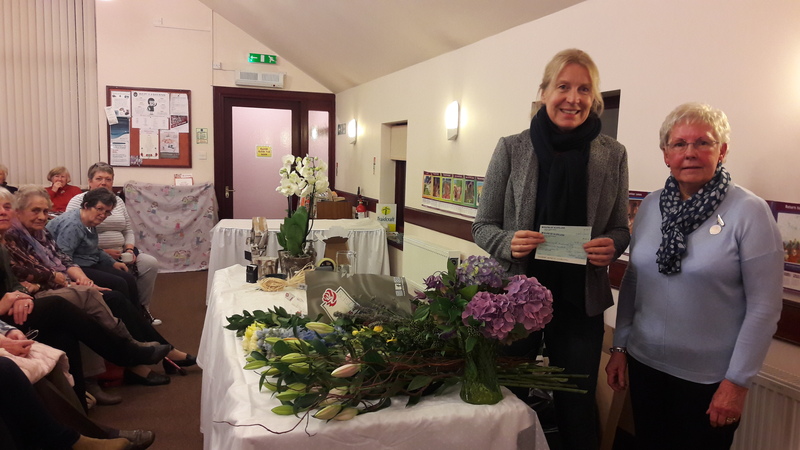 The trustees of the Trust are extremely grateful to Gullane Flower Club for being their chosen local charity for their 25 year celebratory Flower Show held this weekend. Those of us lucky enough to have seen the fantastic flower display in Gullane Church will be in awe at the various arrangements. It is with huge gratitude we thank Maureen Hunter and the rest of the committee for all their hard work in making this event a super success. In addition the collection at tonight’s Songs of Praise, held to bring the Flower Festival to a close at Gullane Church was also in aid of the Trust. Many thanks to all involved including the Senior and Junior Church Choirs, and the accompanying musicians for a lovely evening of song. The Trustees are extremely thankful to the Coop members who have, by simply using their Coop, have raised £857.09 for the Trust. This money will be used to develop the sports hub in Gullane. An excisting update to the project is imminent. If you are not currently a member of the Coop but do use the store, you can by becoming a member, help raise funds for a local charity each time you use your membership card. Please ask at the coop for more information. As some of you will know the Trust is a beneficiary as one of the 3 local charities supported by the Co-op. Each charity benefits from members of the co-op using their membership card whilst buying groceries etc at your local co-op. To highlight this fantastic support to local charities from the co-op, the Trustees will be helping the staff promote the advantages of a membership between 12-6pm today. If you are in the co-op this afternoon feel free to ask about being a co-op member. Astro Repaired & Fully Open. Following further repairs the Astro is now fully open and available for all users. Apologies for the inconvenience. The Trustees are extremely grateful to our local Co-op store and in particular Taylor Carlile the store manager and his staff for their efforts recently in raising £255.83 towards Gullane Sports Development Trust. A 5 aside football competition was held at the recently built astro involving various businesses and groups. Given its success it is hoped the event will become a regular date on the calendar for local footballers. The soon to be reopened refurbished store has also chosen the Trust as one of 3 local causes to support. The Co-op will contribute 1% of what co-op members spend in store to those local causes. Thank You. The Astro Pitch at Memorial Park Gullane is now OPEN as normal. The contractors have repaired the pitch following the Storms of Gertrude and Henry. Can all users please ensure that when you leave the Pitch the gate is closed behind you. Due to damage to the carpet caused by the strong winds on Friday and high winds again forecasted for Monday we have unfortunately have to restrict access to the pitch. Those who have booked the hire of the facility on Sunday and Monday will be able to use the pitch due to it being under adult supervision or it is adult only sessions. Once we know when the pitch will be repaired or the weather allows it to re open for general use a further update will follow.